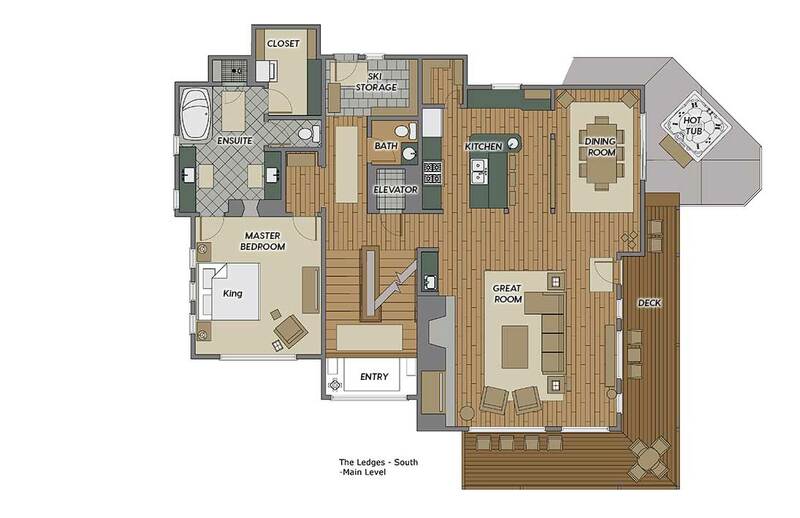 The Ledges offers a quiet location with superior finishes that will delight any group. The breathtaking views of the Yampa Valley and easy access to ski trails make this a very desirable vacation home in every regard. The open design invites everyone to completely relax and enjoy this spacious and stunning residence. The wrap-around deck and terraces are also great for après-ski while soaking up the breathtaking sunsets. The center of your home-away-from-home is the enormous great room with vaulted ceilings and huge windows that bring the views that surround you into this space. The comfortable furniture oriented around the large stone fireplace creates a perfect setting to relive an exhilarating day on the dazzling ski trails of the Steamboat ski area. Next to the great room is a professionally equipped gourmet kitchen fit for any chef. With seating for 3 at the bar, it also a perfect location to sit and enjoy a glass of wine as you watch your personal chef prepare a delicious catered dinner. 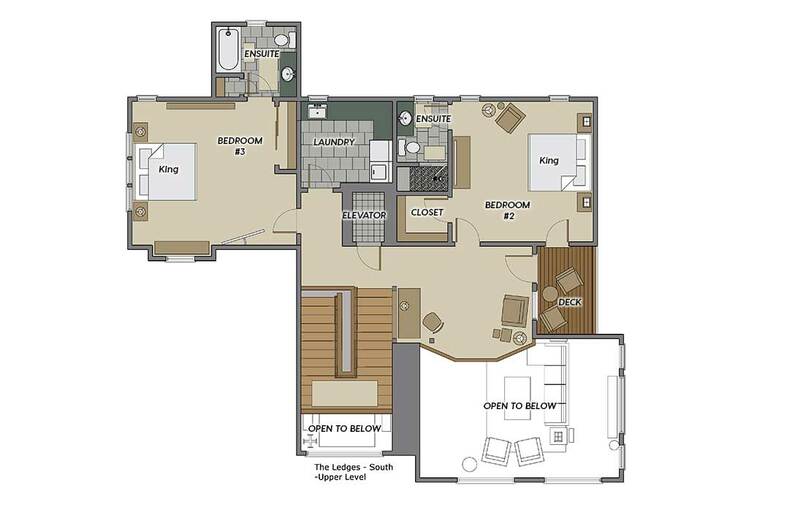 The kitchen offers granite counters, custom cabinetry, multiple sinks, a large pantry, and stainless steel appliances. Imagine all the delicious smells wafting from the kitchen to the great room and over to the dining table. The dining table with seating for 10 people is a great setting for family meals. Surrounded by large windows with expansive views out towards the valley you can enjoy the inspirational location and culinary delights in a place that invites you to linger and celebrate your time together. 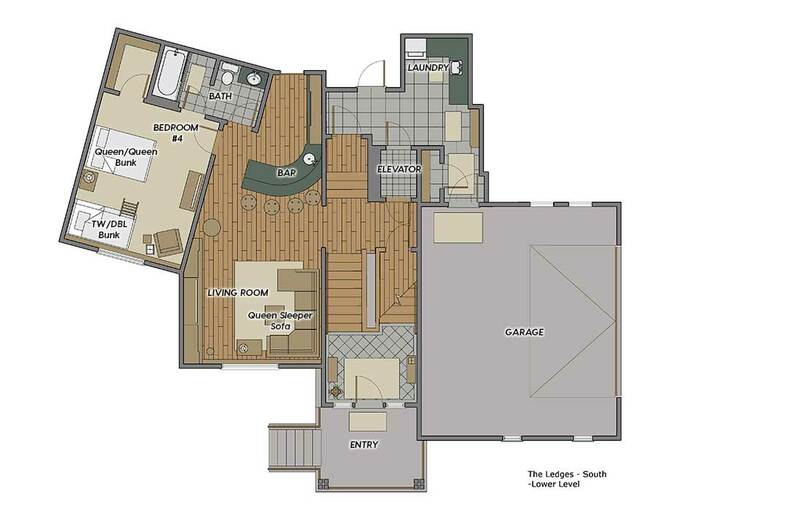 On the main level is the master suite that boasts a double-sided fireplace leading to an attached master bathroom with soaking tub, walk-in closets, separate his-and-her sinks, and a steam shower for relaxing after the day. Upstairs, is a large bedroom with king bed and ensuite bathroom with tub, shower combination. On the same floor is a queen bedroom with ensuite bathroom with shower. On the lower lever there is bedroom with a twin over double bunk bed and a queen over queen bunk bed. This bedroom shares a bathroom with the lower living area. In the recreation room on the lower level you can break out the board games or enjoy a movie together with space for everyone. This room is perfect for entertaining with your own bar with seating for 4. If you need a quiet workspace, on the upper floor there is a loft with desk and seating. The loft also has a "Golden Tee" arcade game if you need to take a break. Don’t forget about the private hot tub for soothing those sore muscles with views of the sun setting over our pristine valley. Mistakenly thought this was ski-out home (totally my mistake). But the awesome shuttle service made up for my mistake. Shuttled our group of twelve to base, Safeway, Ski-Haus, and movies. Very reliable and friendly service. House was beautiful with a gorgeous master bed and bath. Slept our 12 - six adults and six high schoolers - comfortably (with two on a pull out couch). Tons of cooking stuff for our group that preferred to eat at the house. Ski-in under the gondola with record breaking snow was not an easy end to each day but our group loved the challenge. Golden Tee was used constantly and I'm pretty sure we all now think we can play real golf. Lots of tvs, good wifi, warm hottub, and a mudroom with boot warmers round out a very cool place to stay on the mountain.